A conversation with Faith Taylor, Vice President of Sustainability and Innovation, Wyndham Worldwide, Inc. If you want a good case study of how to use innovation and sustainability to cut costs and improve customer service, talk to Faith Taylor. As Vice President of Sustainability and Innovation at Wyndham Worldwide, Taylor is responsible for Wyndham's green and sustainable initiatives for environmental, social, and economic programs. Her responsibilities span the breadth of Wyndham's substantial company, including twelve hotel brands, Worldmark Timeshares and RCI Vacation Exchange Group. Among the innovative technologies she is working to bring to Wyndham locations are solar panels, ozone, clear air allergy-free rooms, and uniforms made of 100% recycled materials. Taylor is a brilliant conversationalist and believes that innovation is the way through today's economic challenges. Her commitment to sustainability and bringing it to bear on reducing the carbon footprint of Wyndham Worldwide is evident throughout our interview. Jo Grogan (JG): With your focus on innovation and sustainability, how is the global economic climate affecting progress in these areas at Wyndham Worldwide? In your experience, how is it affecting the Hospitality Industry? Faith Taylor: Innovation and Sustainability are more important than ever. As we move forward in today's economic environment, it has become even more important to reduce expenses through energy saving programs. When we work towards reducing our impact on the planet, it impacts the reputation of our Brand. Both consumers and investors appreciate Green and Sustainable efforts, and support those efforts through their continued loyalty to companies who pursue the goals necessary to help preserve our resources. I see these issues throughout the Hospitality Industry, and there are a number of organizations and government agencies that are participating in consortia to assist in these efforts. JG: What is the most difficult problem you/your team have solved? Were there any surprises along the way? If so, what were they and what was the result? Faith Taylor: One of the most difficult problems in getting affordable resources. In the initial stages, going green can be more expensive, and that can be a challenge. Educating our company and the public on why it is important to go green is key. We have done this through online tools and offline training, meetings with outside organizations, and vendors. As far as the most difficult problem we have solved, the first that comes to mind is our innovative uniforms. We worked very closely with our vendor, Cintas, to develop and test a uniform made of 100% recycled materials that would be comfortable, durable, and withstand the types of use and care that are necessary in our industry. It took 18 months from product development and testing to getting these uniforms in the hands of our employees for daily use. This cuts our carbon footprint and sends a message to our customers and industry that we are serious about our impact on our planet. JG: What is the most exciting innovation you or your team was involved in developing? What factors made or make it so exciting? Faith Taylor: In terms of innovation, there are several. The uniforms I mentioned above are a great example. Others include ozone laundry systems, which use less detergent and hot water using existing facilities. The use of the systems saves energy and chemicals. We also are implementing Clear Air Allergy-Free Rooms. JG: Tell me more about Clear Air Allergy Free Rooms. Could you elaborate on how those work, and what your experience has been with them? Faith Taylor: Clear Air Allergy Free Rooms remove allergens from the room using a cleaning system for the entire room, special encasements for pillows and beds, cleaning the filtration systems with tea tree oil, a natural anti-fungal, ozone units in each room, resulting in a higher oxygen level. The best way to describe what it is like to be in one of these rooms is the freshness that is apparent after a rainstorm. Basically, we have recreated this in these rooms. We've reduced the energy use by 10-15%. In addition to the energy savings, our guests with allergies and other medical conditions especially appreciate having a clear head, no stuffy nose, and the confidence of being in this allergy free environment. They are willing to pay more for these rooms (about 7 percent more) for the benefits they receive. We have started making these rooms available in our managed properties and plan to expand to our hotel properties in the future. JG: What if any ideation/thinking/problem solving/creativity tools/innovation software do you use or are familiar with? Faith Taylor: We have brainstorming sessions with vendors and work with outside companies and business models, similar to the Department of Energy working with Wal-Mart for energy saving technologies. When we brainstorm, we look at short term and long term focused efforts. After the brainstorming sessions, we develop a menu of options, evaluate and then test and learn, perform cost-benefit and other analyses, and then select the effort we will support. JG: What innovation methodologies, theories, and training are used at Wyndham Worldwide (e.g. Six Sigma, Edward DeBono)? Faith Taylor: We have used Six Sigma, Seth Godin's Purple Cow, as well as various team building and creativity building workshops. JG: Do your innovations come from inside the company, from consultants or outside sources, or a combination of the two? Faith Taylor: Our innovations tend to come from inside the company and with our trusted vendors. JG: What books, articles, blogs, or other media on the topic of innovation have you read? Are there any that you recommend to employees of Wyndham Worldwide? Faith Taylor: I read all the time: articles, books, New York Times, Business Week, Inc., Fast Company, Travel Magazines, Spa Magazines, and Women's Magazines like Oprah's "O"—these all help me keep in touch with our industry and with our clients. I also keep in touch with "YouTube"—look at the most-viewed. My kids introduced me to these, and it's a good way to keep it real. For innovation, I recommend ILO publications and studies, which are well thought out and impartial. I also keep up with a variety of consumer Web sites, including Apple, for new products and ideas. I tend to read and recommend books that cause one to think differently in approaching problems, not just a standard approach. For sustainability issues, I recommend publications on The E-Revolution, how people and the environment are related, and how to develop collaborative environmental relationships. JG: When your teams are working on a problem, or developing a product, and hit a barrier beyond which they cannot move, what do they do? Faith Taylor: We brainstorm solutions and rethink our approach to problems. We look at alternate strategies. We also consider timing and resources, and how we might be able to get unstuck. For example, how do we cope with today's economy and limited resources – how do we do without and still provide services that are needed. Technology is our biggest factor. We have to be wired and hooked in to understand and make the most of our resources for the future. I was just reading a cover story in Inc. magazine about an Asian woman who created a unit to put on the head with sensors that react to your mind to make a mouse move just by using your mind – it was created for gaming, but knowing that something like this exists and focusing on it when we get stuck can help us get outside the box and think of other solutions. JG: Are you familiar with virtual collaborative innovation communities and networks that bring together experts, facilitators, and product developers for confidential collaborative creation? What has been your experience with this type of collaboration? What are the barriers to using such services? How might they be overcome? Faith Taylor: Yes, I am familiar with them. We have used collaborative communities in the form of marketing leadership boards and webinars, but we have not joined communities. Our biggest concern is Intellectual Property in that type of environment. If you develop a great idea, who owns it? In the software industry they do open source all the time. The question is how can we do it for other industries. JG: The company I am writing this article for, IdeaConnection.com, has taken steps to ensure the confidentiality of all Intellectual Property and work done by its experts and to make that work and all communications the property of the company requesting the service. Non-disclosure agreements and training are part of that process. Would something along those lines remove the barriers to doing business with them? Faith Taylor: Yes, anything you can do to reassure and guarantee the confidentiality of the process will help remove the barriers to participating in these communities and networks. JG: Do you have any other thoughts you would like to share about innovation and Sustainability at Wyndham? What's on the horizon? Faith Taylor: I'm very optimistic about our business and have a vision of growth for future solutions. Green solutions and innovative techniques—what a wonderful thing for our children! The current economy provides an opportunity to look at technologies that have been around a while in a different way. It took the crumbling of the economy to make people think about how to use those technologies to benefit everyone. Now, we look at these technologies and say, "Why NOT use them?" There is much opportunity in this environment. How long will it take us to get there? That's the challenge. Celebrate short-term early wins while working toward the long-term solutions. That's how we will thrive. JG: Thank you for your generosity in sharing your thoughts with us. Faith Taylor: It is my pleasure. Faith Taylor is Vice President, Sustainability and Innovation. Based in Parsippany, N.J., Taylor is responsible for leading the strategic vision and direction of Wyndham Worldwide's environmental policy and programs while overseeing all key conservation and preservation initiatives across the businesses including Wyndham Hotel Group, Group RCI and Wyndham Vacation Ownership. Taylor also oversees the Wyndham Worldwide Green Council as well as the rollout of Blue Harmony™, a turn–key spa and fitness program that incorporates a green strategy to promote environmental awareness. Additionally, manages the WyndhamGreen Web site. Taylor brings extensive and unique experience to Wyndham Worldwide as a former executive for Wyndham Hotel Group. There she worked with the architectural firm of Michael Graves & Associates to lead the development of their brand repositioning that included new interior designs, in-room products and hotel prototype initiatives. Taylor recently led the development and launch of Blue Harmony™, negotiated the development of the company's partnership with ENERGY STAR, a joint program of the U.S. Environmental Protection Agency and the U.S. Department of Energy, and co–developed one of the first–to–market green uniform programs with Cintas. Taylor is the vice chair of the American Hotel and Lodging Association's Environmental and Engineering Committee in Washington, D.C., and frequently speaks on innovation and sustainability around the country. 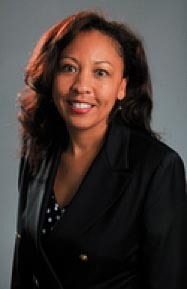 She was named one of the top African–American executives in the lodging industry by Black Meetings and Tourism magazine in 2008 and is featured in Hospitality Technology's October 2008 issue as a leader in innovation. Previously, Taylor held marketing and branding positions for Ramada®, Avon and Time Warner Inc. She earned her Bachelor of Arts degree from Stanford University, Palo Alto, Calif., and her master's degree in business administration from the Wharton School of Business, Philadelphia. Feedback Welcome: If you would like to comment on the above article, please feel free to contact me. If you would like to suggest other innovation decision makers for me to interview, please just let me know.